I woke on Saturday to bright Florida sunshine and sparkling water. After rubbing the sleep out of my eyes and brewing coffee, I noticed that there was water on both sides of the tour bus and that we were driving across a bridge, the Sunshine Skyway Bridge. I was sitting in the front of the bus with our driver Bear and Patrick, our production manager, when I jumped up, "Ohmigod! I had a panic attack on this bridge when I was a kid!" and ran for my camera. Because, you know, elementary school is stressful, especially Montessori elementary school, where you basically tell your teacher what you feel like learning that day and then roll around on the carpet and imagine things. And maybe write a report about it. 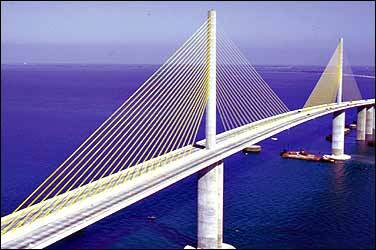 On the drive down I-75 from Ohio to Florida, my dad told me the story of the Sunshine Skyway disaster on May 9, 1980. Which begs the question: WHAT THE HELL WAS HE THINKING? The St. Petersburg Times published an article on the disaster entitled, "A blinding squall, then death" detailing how at 7:38 am of May 9, the freighter Summit Venture - a ship the length of two football fields - rammed into the Sunshine Skyway and knocked out a 1,200-foot length of the bridge across the mouth of Tampa Bay, causing 35 people to plunge 150 feet to their deaths. My dad elaborated by explaining how the sudden storm draped the bridge in thick fog. The drivers making their way across the bridge noticed that all the headlights ahead of them were disappearing. They drove on, thinking the cars were just enveloped in fog, not realizing that they were actually driving off the edge of the shattered bridge and into the water. Then, my dad told me, one man got a funny feeling, an unexplainable intuition, and suddenly stopped his car. He got out and saw, to his surprise, that his vehicle was literally teetering on the edge. Little height-fearing, nail-biting, bed-wetting me latched onto this climactic point of the story and obsessed on that man and that moment. At Camp Joy the previous year, I'd been humiliated by my fear of heights on the ropes course. The course, set in the woods, was meant to instill adventure and confidence in us campers and was a series of increasingly difficult and higher-and-higher-altitude endeavors involving ropes, harnesses, carabiners, and supposed complete safety. "It's more mental than physical," said the counselors. "You can do it if you want to!" Well. Apparently I didn't want to because while others were scrambling their way through the trees and enjoying the grand finale of flying down the zip line to an exhilarating and triumphant finish, I was stuck on the first leg of the course, MAYBE ten feet above the ground. With shaking legs and hands cramped like claws around the ropes, I held on for dear life, cried, and tried very hard not to pee my pants. A line of harnessed kids behind me waited and stared while a counselor tried to talk me through it. When my weeping persisted, I was finally allowed to inch my way back and give up. 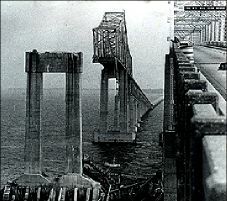 Once armed with detailed knowledge about one of the worst bridge disasters in history, I couldn't stop thinking about how it felt to stand on the edge of death - 14 inches to the side and 150 feet above - an emotion I fully expected to experience myself since another deadly squall would SURELY blow in the day my family drove across. Not helping matters was the fact that construction of the new Sunshine Skyway had only been completed a few months earlier and the half of the span that didn't fall was still standing alongside as a ghostly reminder. In 1990 the State of Florida Department of Transportation demolished the old bridge, since "its usefulness was past and it had become an eyesore as well as a navigational hazard." You think? The new 4-mile long Sunshine Skyway rises 196 feet above the water, nearly 50 feet higher than the old Skyway, but happily its grade is less steep, and many drivers take comfort that they can't see through a steel-grate roadbed to the water so many feet below. I must say I concur.